This is a brief summary of the article “How to help process owners succeed”, posted on Harvard Business Review Blog Network by Brad Power. The management team’s attention shifts to other priorities. Process owners misunderstand their role. Process owners are not held accountable for improvements. Process owners are not senior enough to have the necessary influence. The organizational structure to accommodate the role is too complex. Employees are uncomfortable belonging to business processes rather than functions. Make the process owner role permanent and incorporate it into overall performance management. Select process owners with strong leadership skills and develop those skills even further. Make the process owner accountable for how well the process performs. Give the process owner organizational power. Minimize disturbance to the organizational structure. Create process owners outside the formal organization with a very small staff, leave most people in their functional organizations, and clarify the process owner’s role with respect to the functions and business units they will work with. Help employees get comfortable thinking in terms of end-to-end activities that together generate value to customers. Encourage cross-departmental activities that solve customer problems, and reward cross-departmental teamwork. “Structure follows process”: In the process approach, it is the process which comes to the fore, and not the existing organizational structure (Becker et al., 2004). A process-oriented organization has adapted its structure to the process view. 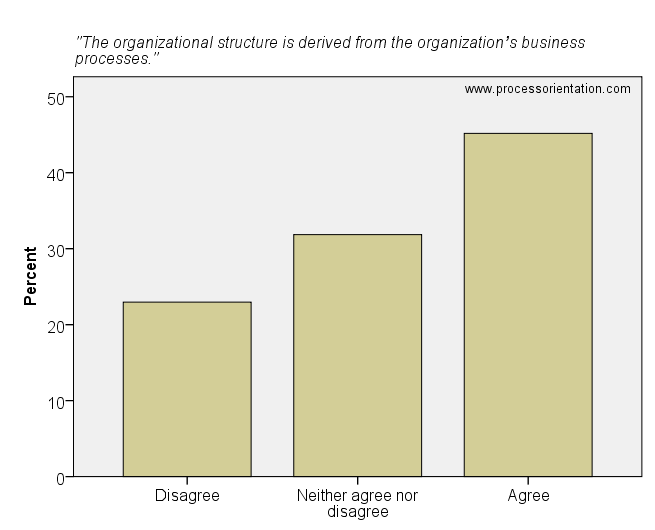 Several authors stress that the organizational structure should be aligned with the organization’s business processes (Schantin, 2004; Suter, 2004; Gaitanides, 2007; Osterloh and Frost, 2006; Kiraka and Manning, 2005).